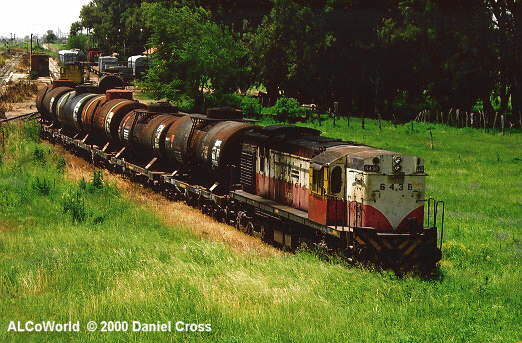 There are narrow gauge and broad gauge DL535 in Argentina. MLW delivered the 40 ng units, while ALCo shipped the 70 5'6" units. So far, only the latter are to be seen here. 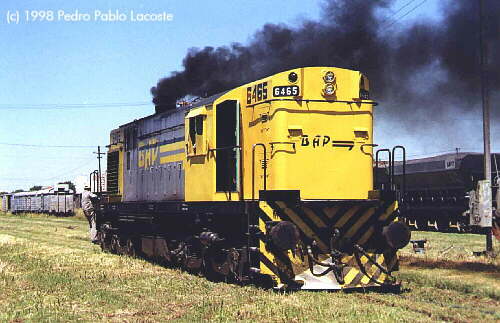 Fresh outshopped BAP 6465, a broadgauge DL535 built by ALCo, pours out some very nice black smoke over Haedo yard. 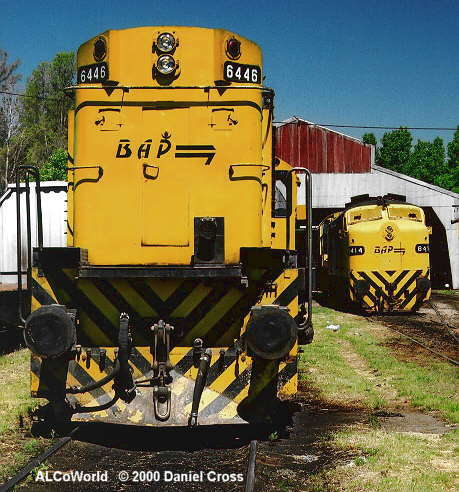 The 6456 is next to GM GR12W # 6619 of the Ferroexpreso Pampeano in the Haedo yard. BAP 6446 and FPD-7 8414 at Justo Daract. Wednesday 15/11/00. BAP RSD-35 6436 rests at Santa Teresa with a train of oil tanks. Note the unusual hump between the cooling fan and exhaust stack, maybe a modification to the locos water tank? November 14th, 2000.